Posted: Sun Sep 02, 2007 12:46 pm Post subject: nate dogg song? got a song stuck in my head... cant find it looked for hours . i think its nate dogg and snoop dogg . when nate doggs part starts he says " Bow wow wow yippee yo yippee yay " any idea's ??? 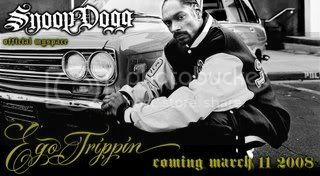 i think it was Doggy Dogg World you should get up on the new album "Ego Trippin"